The Majestic La Sal Range Overshadows the Desolation of "Poverty Flat"
On April 15, 2012, I spent my day to revisiting special locations in and around the Spanish Valley, near Moab, Utah. By midday, I had completed an ecological survey of Behind the Rocks, ten miles south of Moab. After lunch, I depart the Moab Rim Campark, heading south on U.S. Highway 191. 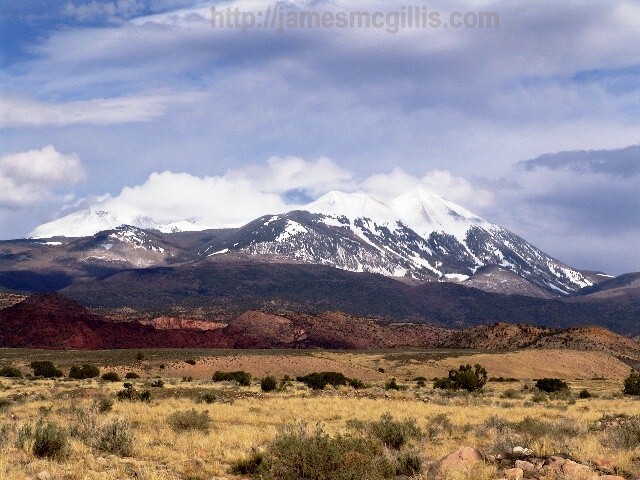 Although I did not know exactly where I might find it, I was looking for an unobstructed view of the La Sal Range. Near the eastern end of the Spanish Valley, I turned left on to a rough gravel road that leads to Pack Creek. With jagged gravel the size of golf balls, the road was not favorable to travel with my fully inflated road tires. 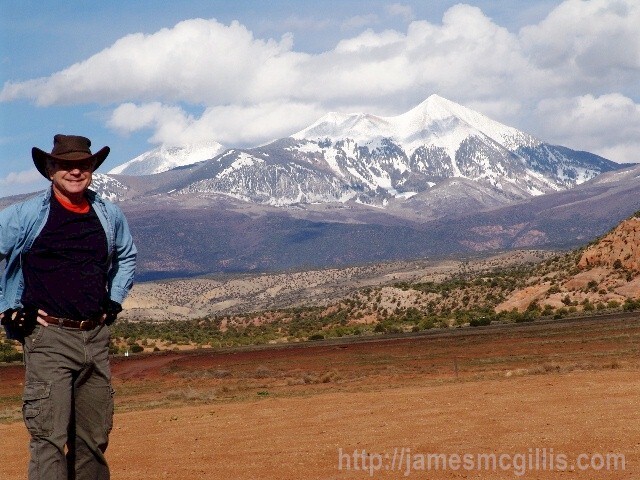 Limping along at a slow pace, I finally found an unobstructed view of the La Sal Mountains. There, in mid afternoon, the sun shone down on the mountains and reflected off fresh snow that fell the previous night. After pausing to photograph the mountains, I turned my attention to the power lines that hung overhead. 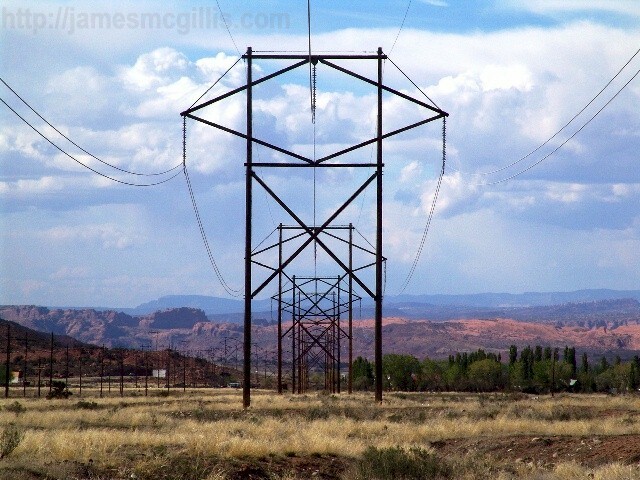 From earlier discussions with Moab residents, I knew that these high voltage lines originated at a coal fired power plant near Price, Utah to the north. From where I stood, I could see what looked like a series of energy beings carrying the electrical cables up the valley from Moab. After passing overhead, the lines continued their climb up the Spanish Valley and then over the mountains of San Juan County. Where they ended, I had no idea. Here I shall explain the difference between the Moab Valley and the Spanish Valley. Other than there being a name change near the San Juan County line, there is no geographical difference between the two valleys. Anywhere near Moab, residents call the drainage the Moab Valley. To the east, in its upper reaches, most people call it the Spanish Valley. The most beleaguered area of the valley, around Ken’s Lake also carries the historical name, “Poverty Flat”. 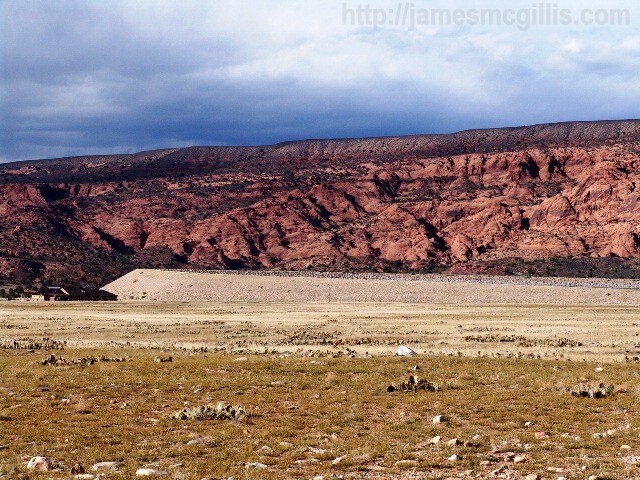 Having experienced the most prolonged overgrazing of any area near Moab, Poverty Flat is apt moniker for that area. Today, it supports only sparse seasonal grasses and a particularly thorny species of cactus. With a large swath of the valley teeming with cactus spikes, no one would dare to graze cattle there now. Even for a hiker the Poverty Flat landscape is like an ankle-high low forest of knife blades. Consequently, the area just west of the Ken’s Lake Dam is now a no man’s land, bereft of greenery and populated only by the hardiest desert dwelling species. In the 1890’s, grass in the Moab and Spanish Valleys grew so high that it hid from view horseback riders who approached town on the Old Spanish Trail. Current visitors to the Spanish Valley realize that the area near Ken's Lake is an inhospitable place, but most have no idea that just over one hundred years ago, this was a Garden of Eden, not the current rock and cactus garden. Since it once held the Old Spanish Trail, I believe that early visitors, ranchers and miners referred to the entire valley as the Spanish Valley. Later, as Moab became a more prominent feature, residents and outsiders alike began calling the lower, western reaches the Moab Valley. Today, the Google Map of the Spanish Valley as the portion of the greater valley inside the border of San, Juan County. Given the importance of Moab and the remoteness of the eastern part of the valley, Google’s dual designation of the Moab Valley and the Spanish Valley seems like a good one to me. After viewing the extreme environmental destruction in the Spanish Valley, I headed for the human made creation called Ken’s Lake. You may read about that visit in my next article. On April 15, 2012, I drove from Moab, Utah to Behind the Rocks. There, for one long weekend each year, that area is the hub of activity for the 24-Hours of Moab off-road bicycle race. It had been six months since my October 2011 visit to the event. Half way between the two races was a good time to assess the environmental impact of annual off-road bike racing Behind the Rocks. Behind the Rocks is a sandy-soiled mesa ten miles south and two miles off-road from Moab, Utah. In spring, summer and fall, since the 1890’s, cattle had grazed Behind the Rocks. Before its first ecological breakdown, the fragile mesa endured decades of overgrazing. Only its 5500-foot elevation has kept the area from cactus infestation, as happened in the upper section of the nearby Spanish Valley. Under the trampling hooves of range cattle, indigenous cryptobiotic soil deteriorated and blew away. Whatever natural vegetation may have existed prior to a century of grazing, the mesa now supports a combination of weedy and grassy areas. Kane Creek provides the main runoff channel for the entire mesa. Although the spring flow can be intermittent or nonexistent, summer thunderstorms sweep huge amounts of soil down Kane Creek. Increased movement of soil amplifies streambed erosion. Where small watercourses once meandered, sandy arroyos with straight-sided banks now stand. Some areas have lost all their soil, leaving expanses of bare rock. For the past seventeen years, hundreds of off-road bicycle racers and fans have camped, played and ridden Behind the Rocks each October. Each year, self-appointed guardians of the local environment lament supposed damage done by the 24-Hours of Moab Race. Some hike cross-country in order to photograph a few bicycle tracks that stray from the designated course. The real issue is not only about damage by errant bike racers. It is also about the monitors tramping across a fragile landscape in order to “get their shot”. 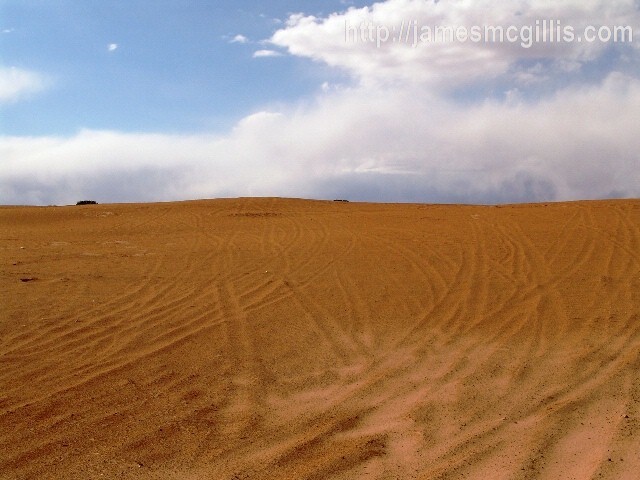 Driving across the deserted landscape that day, I could not locate the bicycle race venue. Without its tents and bicycles to identify it, I drove on by. Soon, I came across an open area eroded by off-road vehicles. Along the fringes of the area, I could see how vegetation had once held the soil. Within the eroded area, there were only traces of native vegetation. Although I saw no off-road vehicles Behind the Rocks that day, evidence of vehicular traffic was everywhere. One nearby sand dune had hundreds of tracks leading to its summit. 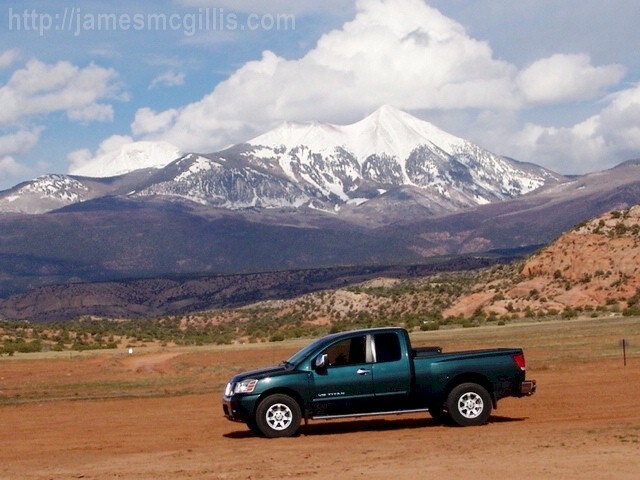 Getting out of my truck, I surveyed the 24-Hours of Moab Race venue and the La Sal Range beyond. Admittedly, there was little vegetation where the main tent had stood. Only after leaving my vehicle did I realize the damage that I was causing. Looking down, I saw that the wide tires on my truck had crushed whatever soil-crust had formed since October 2011. Otherwise, the race venue looked quite similar to much of the surrounding landscape. During my earlier discussion with 24-HOM race promoter Laird Knight, he had told me about their environmental amelioration techniques. Each year, after all trash, facilities and vehicles depart; Knut & Sons roll their enormous water trucks around the empty venue. A generous sprinkling of water turns fields of dust into fields of mud. As the sun dries the mud, it forms a crust almost as strong as natural cryptobiotic soil. Unless churned by wheels, hooves or feet in the off-season, Laird said, “Racers and visitors to the next 24-Hours of Moab Race can expect to see the area look much as it has for the past eighteen years”. Rather than seeking to end the one family event that helps to regenerate the environment Behind the Rocks each year, environmentalists should concentrate on overuse by off-road vehicles. The Bureau of Land Management should place an immediate ban on driving in watercourses and sensitive dune areas. If not, the remaining soil on the mesa will continue its slow-motion disintegration down Kane Springs Canyon and into the overburdened Colorado River. 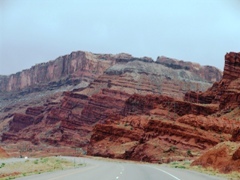 On April 14, 2012, I headed toward Moab, Utah on U.S. Highway 191 South. By the time I picked up Kokopelli at Canyonlands Field, it was mid afternoon. As we approached the Moab Pile, I turned right on to the Potash Road and then a quick left into a dirt parking area. From there, we could look down on the Moab UMTRA toxic cleanup site. Since my last visit to the UMTRA site, federal stimulus funding had run out. Now the Moab Rail removal process was running only part time. In addition, flooding in 2011 had wiped out the bicycle path along the Colorado River. As I viewed the toxic and radioactive waste site, there was no human activity at all. Seeing that lack of activity was disheartening, but expected under current economic conditions. Turning my attention to the Potash Road, I spotted a variety of bicyclists heading downhill towards Highway 191. With numbers affixed to their chests, they appeared to be near the end of an extreme athletic adventure. Two men with the number 227 across their chests were waiting there for a team member who had faltered on the racecourse. 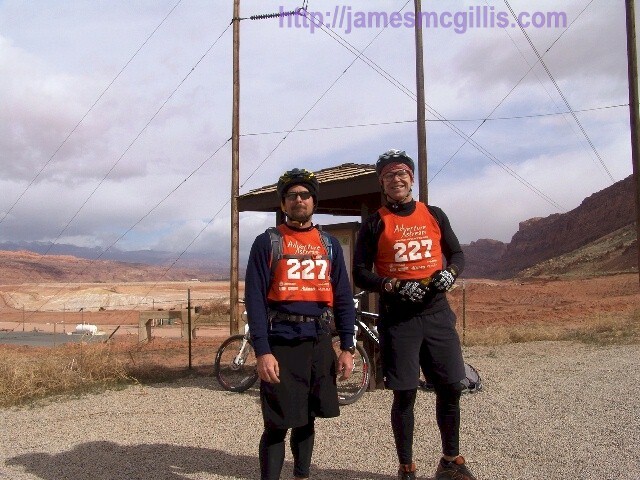 Talking with them, I learned that all of the bicyclists were part of the Moab 2012 Adventure Xstream Race. After watching a lone rider’s slow descent of the Potash Road, I noticed a couple who had stopped nearby. From the 227 team, I had learned that an individual, a team or a couple could enter this race. All in one day, the race includes paddling a kayak down the Colorado River, a cross-country run, a rope-assisted climb up a rock face and then a repel down another steep slope. 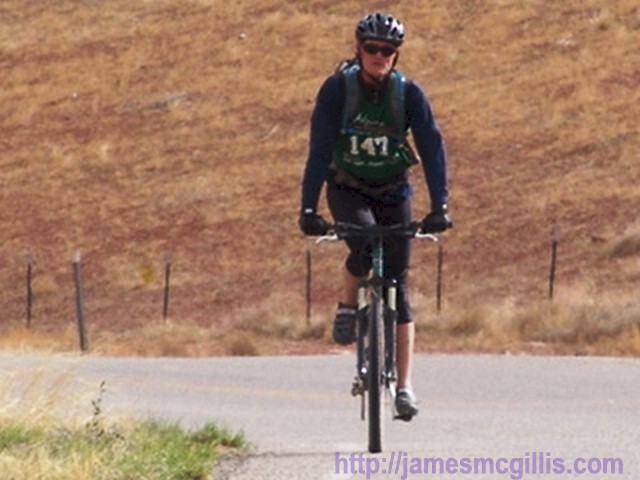 After all that, participants ride their bicycles many miles back to the finishing line near Moab. Stopping for only a brief rest, the couple looked in good shape to complete the race. As I spoke with them, Kokopelli got restless while sitting in the truck. Soon he started glowing more different colors than the old Atlas Uranium Mill, below. Not wanting to risk his blowing a flux capacitor, I invited Kokopelli out to meet the race participants. With his unique personality, Kokopelli and the female racer bonded immediately. 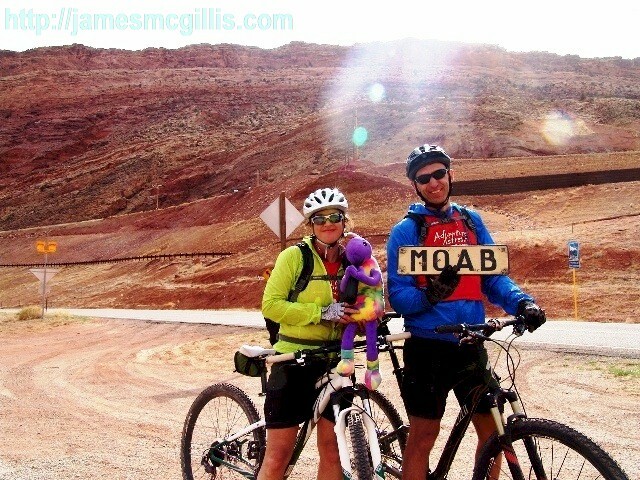 In order to document the scene, I asked the man to hold my old Moab sign while the woman gave Kokopelli a squeeze. Just as I snapped the picture, a flood of new energy light came down from the sky above the Moab Rim. Such plasma flows are common in and around Moab, but this was the first time I had seen new energy light anywhere near the Moab Pile. Unless you count the phosphorescent purple dust devil I had seen the year before, I believe this was the first such documented event. After getting his picture taken with the race participants, Kokopelli calmed down and dropped to a lower energy state. It had been a light snow season in and around Moab the previous winter. 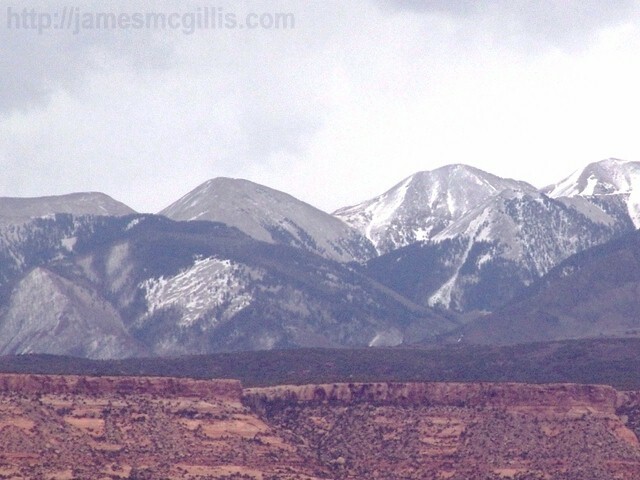 Even so, an early spring storm had just dropped a fresh white frosting on the nearby La Sal Range. 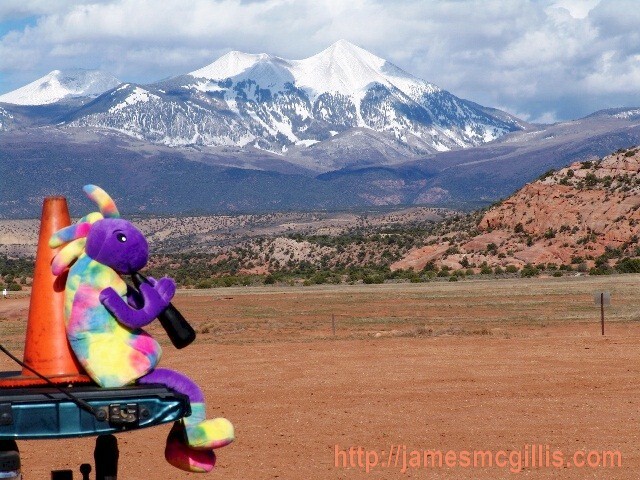 As plush Kokopelli and I headed toward our campsite at the Moab Rim Campark, he snapped the picture of the La Sal Mountains that you see here. The following day, Kokopelli and I planned to visit Behind the Rocks, looking for evidence of environmental degradation at that site. I will save that story for my next article. 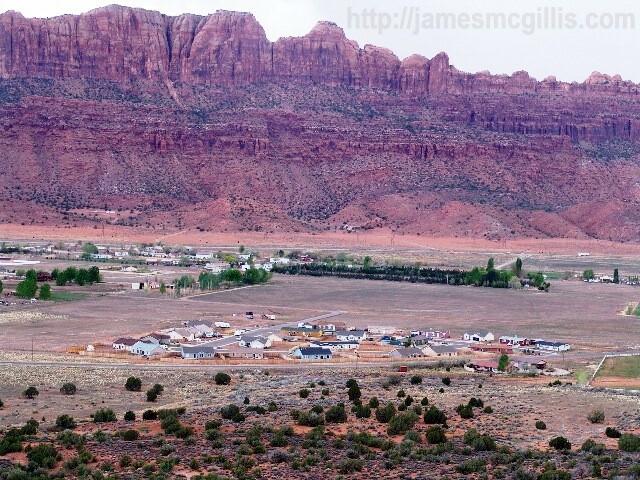 Several times each year, I drive the thirty-one miles south on U.S. Highway 191 from Crescent Junction to Moab, Utah. 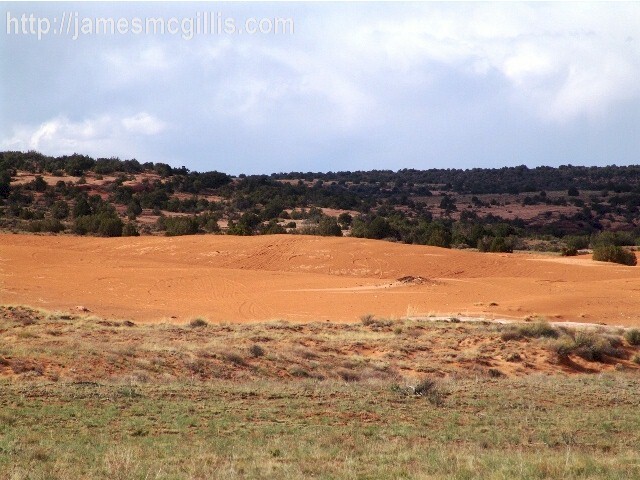 Other than the industrial-sized natural gas drilling rig hiding off to the left, the first half of the drive features an unremarkable desert environment. About four miles north of Canyonlands Field there is finally something interesting to look at. To the southwest, atop a bluff is a lattice-steel communications tower. With its heavy structure, the tower looks more like an old-energy oilrig than a communications tower. By its shape and size, the tower appears designed to support heavy loads and to withstand high winds. 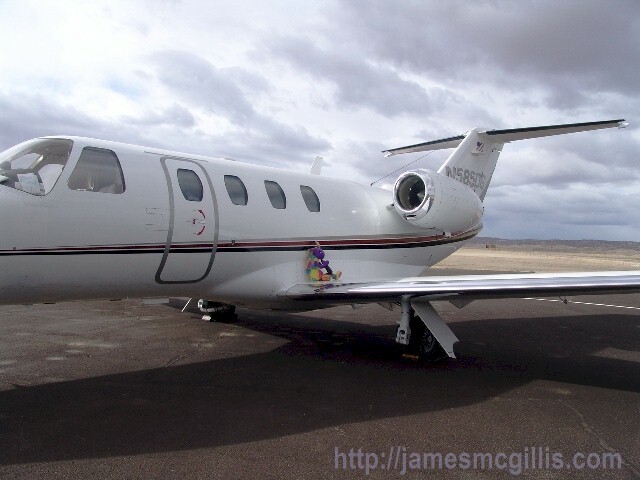 During my April 2012 transit to Moab, I decided to investigate what purpose this unusual tower might serve. Since the tower access road intersects with Highway 191 on a straight stretch of four-lane road, I planned early for my exit. Speeding and tailgating are common along this stretch of highway, so I slowed and waited patiently for traffic to clear. As I approached the intersection, I braked hard. In a cloud of desert dust, my truck and travel trailer soon came to rest in a run-off area just beyond the intersection. Although I had hoped to take the access road up to the top of the bluff, not far from the highway I encountered a locked gate. Not wanting to trespass into a secure location, I took the time to read the only available informational sign. From that mandated steel sign, I soon had enough information to research what I call the Moab Tower. Owned by American Tower (NYSE: AMT), the site name for the structure is “Crescent Junction”. The real Crescent Junction is almost fourteen miles north of the site. With over 47,000 owned or managed tower sites around the world, the Crescent Junction tower is one AMT’s wireless network colocation towers. With its one hundred eighty-five foot height, I could imagine the tower having a clear line of sight to another AMT tower at Green River, Utah. Looking southeast toward Moab, I could not determine if another energy tower above Moab might facilitate communications there. As it turns out, the tower was once part of the AT&T microwave tower network. After my ten-minute visit to the “Moab Tower”, I decided to get back on the road. As I returned to my rig, I noticed that the stop sign at the highway intersection had torn loose from its mounts. There it hung head down, with a view of the Klondike Bluffs in the background. After waiting for traffic to clear, another cloud of dust followed me as I swung back on the highway to Moab.